Summary: In July 2008 I forecast that McCain would win. Earlier, in February, I predicted that Obama would be a weak president. This election we’ll double down: Romney will win, and prove an effective President — implementing major reforms. Very effective for the 1% who purchased his election; less so for us. Romney seems most likely to win. A weak economy looks probable. A demoralized Left seems certain after four years of Obama walking in the footsteps of Bush Jr. The combination will put Romney over the top. President Obama has ruled far to the right of Candidate Obama, with key policies diametrically opposite his platform. Yet, dog-like, much of the Left still loves him. But fewer than in 2008, and with less enthusiasm. Candidate Romney has developed flip-flopping into a fine art, running against his only major accomplishment during his single term in office. Plus a stunning record of mendacity (well documented at MSNBC’s Maddow Blog). These skills give Romney an advantage over Obama. His winning emotional edge will come from the GOP’s successful demonizing of Black Islamic Foreigner Anarchist Socialist Obama. We see all these things displayed in Romney’s speech on April 13 at St. Louis to the NRA National Convention (excerpts from the Fox News transcript). Almost total fiction; of course Romney gives no specifics. Excerpt for the national security policies supported by both parties, involving growth of presidential power beyond the Founders’ nightmares. As Obama expanded Bush Jr’s powers, Romney will expand those deed by Obama. Since Obama has cut taxes, there have been no tax hikes — let alone tax hikes that slowing the economy. 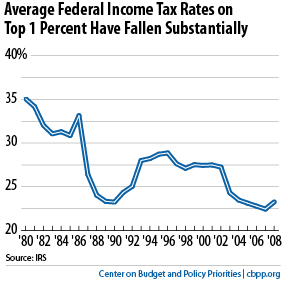 Taxes are at multi-generational lows. Romney follows this with descriptions of future tax hikes Obama has proposed (conjectural, hence with no economic impact). Looking ahead, the math of Federal budgets makes tax hikes are almost inevitable. President Romney will probably follow President Reagan and President Bush Sr on the list of America’s top tax raisers. The centerpiece of the GOP campaign is the attack on Obamacare. A law devised by conservative think-tanks, modeled largely on Romney’s major accomplishment as Governor of Massachusetts, applauded by many of the GOP leaders who now attack Obama. Most important, it addresses the largest threat to the government’s solvency — and a major drag on US competitiveness — the rising cost of health care. The GOP response is smoke, hand-waving. Whoever wins in 2012 will take strong measures on health care (Obamacare is only a small initial step). Romney shows himself well-qualified to do so by his abandonment of his own words and deeds, showing no attachment to his past (suitable for the leader of an amnesic nation). After election he can repeat this process, returning to the 2006-vintage Romney. Romney says what’s necessary to win. To gain votes from a foolish people one must say foolish things. 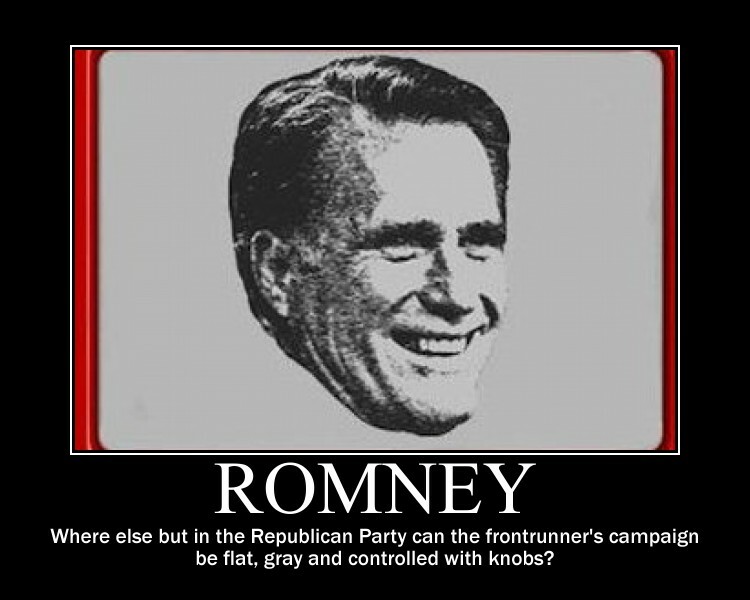 Romney’s history shows that he’s no fool. Believe his past deeds, not his words. This is the lesson of campaigns 2008 and 2012: no matter how the candidates prance and gibber, once in office they take the difficult measures necessary to execute the will of our ruling elites: to produce economic stability, low taxes for the rich, less regulation (eg, Obama’s JOBS bill; see below), eroded civil liberties, a stronger and slowly combining police-intelligence-military complex. There is no reason to fear that America will collapse. But we are on a path to become a new nation, sharing only the name and location of what we once were. There is still time to change. (A) To see the real erosion of liberty in America read the recent articles at Salon. Glenn Greenberg and his guest authors report from the front lines in the battles to preserve our freedoms. We’re losing. Previous Post Fear not! America will not fall due to its citizens’ imprudence. We’ve found a sure solution. Next Post Some important articles. Mirrors in which we can see America. You’ve correctly identified the President’s weakness in the economy but the US government is going full blast in putting the most positive spin possible on the numbers and an amazing percentage of the media and commentariat are overemphasizing the spin. The fact of the matter is that this country desperately wants to believe it is doing very well and is perfectly willing to lie to itself for as long as it takes to actually succeed. “Fake it till you make it” is another variation on our broken OODA loop. I’m sorry but I must profoundly disagree with you. He has sought the Presidential nomination for 5 years now and has displayed quite a large number of profound gaps of communication such as “corporations are people too.” He’s right when you think about it but the way he put it does not reassure anybody. Romney has to know that the economy is weak and is not likely to get much stronger for the next few years and yet he continually makes promises and statements that can and will be used against him. You correctly identify healthcare as a major drag on the US economy but Mitt has already so hemmed himself in that he will not dare offer any policy changes other than dismantling the Obama health plan. I believe Mitt will offer no domestic initiatives other than approving ever more draconian Homeland Security initiatives and ever larger tax cuts for the wealthy. Agreed. But this inspires fear and loathing not confidence. Candidate Obama in 2008 chose his words with much more care and you knew that there were topics he would not speak favorably about. Both candidates are terribly damaged goods. This is the weakest pair of candidates since at least 2000 and is probably the weakest election cycle involving a sitting President since Truman in 1948. Obama would probably be a more effective President than Romney for the same reason that Bush was better in his second term, experience. But that doesn’t mean that either man can or will effectively govern the country. When it comes to forecasts, all we can do is guess. You might be correct. As for Romney’s history, don’t look just at his Presidential campaigns. Look at his career in business and as one-term governor of MA. And no fool makes it into the big leagues. “McCain will win?” Didn’t know he was running… typo? Thanks for catching this! Fixed! The List is long And where do you envision when you awake at 3 AM and turn over to your wife and wonder—–what are we to do? America has already failed and the seeds of such were sown many many years ago. Romney? Obama? Chocolate or vanilla?. Perhaps you expect too much of our political leaders. Only a comprehensive tyrannical State assumes responsibility for the nation’s culture, let alone the character of its children. As for the rest of your list, I recommend reading about the lives of our forefathers. You live in paradise compared to most of them. Who expects what of your Political Leaders? We are discussing a Culture (always) A Nation A Social Meme. Your Forefathers are certainly responsible in many ways for where you find us these days. That is what spawns the Leaders. Collapse…recall? America is the sum of its history and philiosphical underpinnings. You live in Paradise maybe, if consumption is the end all, be all, of your Life. Flush toilets can replace only so much peace and sense of balance, connection with a Community and a life well lived with good posterity, in view. Mumford (and many more) tried for years to offer alternatives. These writings can offer insights into the shameful Political Theater that operates today. Don’t bemoan the Path of Oabama/Romney and then offer us the illusion of the Life of our Forefathers. This is only the latest Chapter in a hundreds years novel. It did not “just happen” all on its own with these last few generations. We are arriving, everyday. You do not like the Station of Embarcation? ….move along. There was no golden age. Things have never been better or safer. Medicine, dentistry, air conditioning, cable TV, super markets, ethnic restaurants, cheaper air travel….Today’s middle class in day to day matters are materially better off than the 1950’s rich. Are the political class responsible for this? No just the beneficiaries but they have a problem. To justify themselves they must cause fear which only they are equipped to protect us from and leverage greed which will end once they have made the rich pay etc. Agreed. For evidence see the posts listed on the FM Reference Page Good news about America. But do you gladly trade your freedom for material progress? I don’t. Nor is any such trade necessary. I see this differently. We elect and re-elect people who lie to us, just as we applaud media experts who do so. Elections are opportunities. Nobody forces us to wisely make use of them. The difference is that when Obama brings in the new-fa.., err, neo-con policies that the left is paralyzed by partisanship and won’t say a thing. They don’t want to help the evil republicans. With Romney, they’ll all be activated and the press again will start reporting this stuff. It might actually work out better. And I would qualify this slightly. I think at some level Obama is actually foot dragging on the Iran war. It’s likely Romney might be more enthusiastic about getting the next big war started. So that’s definitely a negative. The so-called press is gone. If you want to find cutting-edge reporting, look on the internet–the MSM will not cover anything considered ‘controversial’. This brings us to a similar situation (for accurate news) that the colonials and early citizens of our country had–you can’t trust everything you hear or read. Unfortunately, Robert is right. Try comparing mainstream US news sources against offshore news sources on any topic. The US news sources will always be relatively close to the US government position regardless of the facts presented by other news sources. US news sources discovered some time ago that it is far more profitable to take the US government’s statement of what happened and why than it is to investigate the facts independently and to come to their own conclusions. The Watergate scandal, one of the defining issues when the baby boomers came of age, would likely not have happened if the events that spawned it had occurred 40 years later. These days the US news media is not interested in whether or not the President lies or exceeds his constitutional authority. These issues are not profitable for a modern American news media company in any sense of the word and companies are driven exclusively by profit. I agree on all points. The useful news media today tend to be offshore. The Times of London and Financial Times (excellent but gated) and the other major UK papers. Der Spiegel. The hot new entrant: al Jazeera — increasingly often breaking big stories, attracting high-quality western writers, and succeeding by the important metric of mentions by significant sources of insight. I can’t argue that a Romney administration will differ in any significant way from that of Hope’n’Change. Which is why I’m sitting the 2012 circus out, for the first time in my life. I voted **against** McCain last time — Obama’s given me zero reason to vote for him, and lots of reasons to wish him gone. In some ways I believe he’s been **less** competent than the Bush-Cheney cabal, which is kind of astonishing. But that’s just me, and while I suspect that lots of other aggravated Dems and lefties are going to stay home also, I don’t think it will be enough to give Romney his win. Even by the standards of American politics the guy’s an abysmal candidate. And there’s his Mormon background. To my mind it’s just another oddball religion, but apparently there are lots of born again types who really dislike Mormonism — so there’s likely to be a large stay-at-home bloc among Republicans, too. In the absence of something really dramatic, 2012 is Obama’s to lose. But whoever wins, it’s probable that his “mandate” will encompass maybe, generously, around a fifth of the adult population. That’s the mark of a system losing legitimacy. Don’t sit out the elections, you’ll just be verifying the politicians disdain for you. Vote third party and send the major parties a message that you are dissatisfied with them and are looking for alternatives. It won’t necessarily have an impact on the immediate politics but it will prevent the major political parties from benefiting from ignoring you. I figure the tipping point will occur when 3rd parties win over 10% of the vote. I’ll cast ballots for local offices, but I think that no vote gets across the illegitimacy of the system quite like “Abstain”. And it IS illegitimate — laws and their enforcement are nothing more than commodities, up for sale. The status quo, as you state so eloquently above, will prevail. But Obama will be in for another 4 years. Those of us who continue to hope for the best will still show up in enough numbers to give the advantage to Obama. Our new nation will lose more of it’s hegemony to South America, the Middle East, India, and China. I would lend a little more credence to the protests in Europe and the Middle East. There will not be a collapse, persay, but much greater strife and social unrest in the USA, regardless of the presidential outcome. Real inflation, environmetal factors, loss of our manufacturing base, our debt, a corrupted judicious process, loss of our freedoms, and the structural inequality of our political system make civil unrest almost a certainty. In 2008, you cited two reasons why McCain will lose to Obama. 1) He doesn’t have whole hearted support of the base 2) He doesn’t want the job badly enough. In hindsight these were excellent predictors. Applying them to today’s contest, Romney would fall short on #1. I would concede #2 as Romney wants to be President probably more so than Obama wants to get re-election. However, Romney has the same problem as McCain when it comes to the base. Conservatives will hold their nose and vote for him but nothing more. Even based on your past model the evidence for your prediction seems to be mixed. Comments? We can only guess at such things, but I disagree. McCain Romeny will have full support of the GOP base. They’re united by their hatred of the foreign-Islamic-athist-anarchist-socialist Obama. This is typical. As the political parties become more alike in policy, the necessity grows to demonize the opposition in order to distinguish us from other. Plus, the GOP faithful are conditioned to believe anything (no matter how bizarre). This will make it easy to motivate the faithful. “You say potato, I say Romney.” What’s the difference? Fixed! Thanks for catching this. So America gets to pick a fourth term of Bush the Younger i.e. Obama or a first term of Romney who basically says whatever people want to hear without sounding too shrill to startle the proles. This is truly how a nation dies…one gets the feeling the Cold War somewhat quickly followed by the Global War on Terror shredded the Constitution. Maybe damaged beyond repair. Fabius, how did we become so weak? I don’t know how we got here. I fear that my solutions are weak. Two, the internet Democrats need to understand the basis of George Washington Plunkett politics, which is that votes come from getting voters turkeys at Christmas. Voters want stuff, information on how to live their lives, increased incomes, a better world, tax cuts, the trash picked up regularly, whatever – and if you can’t credibly get it to them, your message is unpersuasive. It’s not that your arguments don’t work, it’s that you aren’t a trusted messenger, and you can’t win in a low-trust fight because low trust channels are dominated by oligarchs. This is why the failure of the internet progressive space to focus on wages or foreclosures from 2006-2010 was so catastrophic. It’s why the fact that health care doesn’t kick in until 2014 carried significant political costs. There simply is no progressive advantage on economic arguments anymore. Sheyman laid out standard left-but-not-too-left policy prescriptions – reimplementing Glass-Steagall, lifting the Social Security cap on earnings, Medicare-for-All, gradual withdrawal from Afghanistan – and they didn’t work. Why would one really junior member of Congress without any substantive record of accomplishment really matter? Why would anyone trust the progressive brand on economics? America is at war with reality…and we’re losing. Truer now than ever. A populace drifting off into La-La Land over its adoration of a nonexistent liberal president in total denial of his extreme far-right governance, while his near-billionaire challenger promises to undo nonexistent harms and implement crazy policies guaranteed to speed America’s decline…bizarre indeed. That was a very well-thought-out description, TM. I commend you on your firm grasp of the situation. I’m also going to copy it and plagiarize it! We’re getting the government we deserve. What a bitter pill. “There’s just no benefit that the JOBS Act brings to an honest startup company. In fact, it puts an honest company at a severe disadvantage, because now it has to compete against other, less scrupulous companies that can simply make their projections up on the backs of envelopes. This bit here gets right to the heart of the matter. Taibbi has been hammering on the JOBS act, (link above), and it just sounds so awful. This is the new way — we take the fraud-based economy and spread its wonders to even more of the economy. Let 1000 Madoff bloom. It will produce short term imaginary benefits, but this kind of fraud is like a cancer. It will hollow out the economy, everything will rot away. Review of The Candidate: What It Takes to Win—and Hold—the White House by Samuel L. Popkin. For many years, specialists in universities believed that American political events could be explained by the methods of economics and political science. The recent lackluster jobs report, for example, showing just 120,000 private-sector jobs added in March, is precisely the sort of fact that these experts would find explanatory. They assumed that party politics didn’t really matter that much — that when it came, for example, to making decisions about economic policy, politicians of both parties, though they would disagree on some fundamental questions, acted rationally, listening to the views of their respective economic experts and attempting to carry out their recommendations in as much good faith as the sausage-making processes of party politics would allow. In 1988, Democrats nominated the former Governor of Massachusetts, Michael Dukakis, as their candidate for President of the United States. Dukakis is considered by many — including me — the most hapless and futile Democratic Presidential nominee since 1956. While McGovern had the tenor of the times and Nixonian dirty tricks to blame, and anyone — much less Walter Mondale–was doomed running against Ronald Reagan in 1984, Dukakis was nominated in a cycle Democrats had every reason to believe they could win. But he was crushed. It wasn’t even close. I believe that for many of the very same reasons most of us Democrats prefer not to remember Dukakis — he certainly hasn’t been a visible Party figure since — Willard Mittens Romney will be an embarrassing memory for Republicans after he is trounced by President Obama in November. (3) “A Little Less Unscorable“, Menzie Chinn, Econbrowser, 17 April 2012 — More details about the Romney plan. Standing on the floor of a shutdown factory visited during the 2008 campaign by then-senator Barack Obama, Mitt Romney suggested that workers would have returned by now if it weren’t for the President’s economic policies. So Mitt Romney gave a speech at a closed Ohio drywall factory, which he tried to use as a symbol of Obama’s economic failure. The symbolism was perfect — not as an illustration of Obama’s failure, but as an illustration of just how stupid Romney thinks we are. Even regular reporters noticed that the factory in question closed under, yes, George W. Bush — a fact Romney failed to mention, although his campaign scrambled to cover for him afterwards. What I didn’t see mentioned was the point that this was a drywall factory — that is, a supplier of a product largely used in home construction. It’s one thing to say that Obama should have revived the economy as a whole; it’s another to say that he should have brought back the housing bubble! Political scientists at George Washington, Yale and UCLA believe most elections can be predicted with just a few pieces of information. They created a formula that uses economic growth, presidential approval ratings in June and incumbency to forecast President Obama’s share of the two-party vote in the Nov. 6 election. This is the second part of my discussion of N. Gregory Mankiw’s column asserting that governmental competition is desirable for the same reason that private competition is. Mankiw was Chairman of President Bush’s Council of Economic Advisors from 2003-2005. He was one of the principal architects of the perverse incentive structures that proved so criminogenic and drove the ongoing financial crisis. He gave no useful warnings of the necessity for containing the developing crisis – even after the FBI’s September 2004 warning that mortgage fraud was become “epidemic” and would cause a financial “crisis” if it were not contained. He is now Mitt Romney’s principal economic advisor. His column favors the “competition” argument that led him to support crippling financial regulation even as private sector competition led to endemic fraud. Mankiw is a moral failure as well as a failed economist. His infamous response to Akerlof and Romer’s 1993 paper (“Looting: the Economic Underworld of Bankruptcy for Profit”) was that it would be “irrational” for CEOs not to loot “their” corporations. He ignored all of the prescient warnings we made about how accounting control fraud drove our crises and he continues to ignore those warnings and the reality of our recurrent, intensifying financial crises. He wants the U.S. to move even more rapidly downward in the “competition in regulatory laxity” that is driving those crises. Can Barack Obama campaign his way to re-election in the face of conditions in US that would normally spell defeat for any incumbent? This is exactly why those election prediction systems are worthwhile. Well, you don’t need them, exactly; you could take postelection explanations, instead. But, basically, it’s extremely useful to be able to specify what happens when presidents run for re-election “in the face of conditions” such as those Obama will face this year. The answer, of course, is complicated…but still, we have some pretty good evidence that it’s the current rate of growth, not the overall level of growth over four years or the absolute level of any indicator, that seems to matter. And by that measure, what Obama faces would spell “marginal favorite” or “slight underdog,” if — and it’s a big if — the economy chugs along for the next few months at more or less the pace that most economists expect. Or, if Larry Bartels is right and it’s a large plus if a president is sworn in when the economy really stinks, then Obama is a marginal-to-solid favorite (again, if the economy does as expected now). Anyone who starts talking about “conditions in US that would normally…” really should know this stuff. Now, granted, there’s a big caveat in order. No one has ever run for re-election in exactly the same circumstances. No one else ever took office during the depths of a horrible recession, which then abated rapidly, but then never kicked in to a normal, strong, recovery (that is, with quarters of 5% growth or more). There simply is no direct precedent. What we’re doing is extrapolating from sort-of similar situations as best we can, and prediction system skeptics are quite right to point that out. Still, on balance, I’d say it’s a lot more wrong to call the current situation “conditions in US that would normally spell defeat for any incumbent” than it is to say that we have conditions that would normally make a president a marginal favorite. If you want to appreciate what Barack Obama is up against in 2012, forget about the front man who is his nominal opponent and look instead at the Republican billionaires buying the ammunition for the battles ahead. A representative example is Harold Simmons, an 80-year-old Texan who dumped some $15 million into the campaign before primary season had ended. Reminiscing about 2008, when he bankrolled an ad blitz to tar the Democrats with the former radical Bill Ayers, Simmons told The Wall Street Journal, “If we had run more ads, we could have killed Obama.” It is not a mistake he intends to make a second time. The $15 million Simmons had spent by late February dwarfs the $2.8 million he allotted to the Ayers takedown and the $3 million he contributed to the Swift Boat Veterans demolition of John Kerry four years before that. Imagine the cash that will flow now that the GOP sideshows are over and the president is firmly in Simmons’s crosshairs. His use of the verb killed was meant in jest, of course, much as Foster Friess ($1.8 million in known contributions, and counting) was joking when he suggested that “gals” could practice birth control by putting Bayer aspirin between their knees. America’s billionaires are such cards! And we had better get used to their foibles and funny bones. Whatever else happens in 2012, it will go down as the Year of the Sugar Daddy. Inflamed by Obama-hatred, awash in self-pity, and empowered by myriad indulgent court and Federal Election Commission rulings, an outsize posse of superrich white men will spend whatever it takes to have its way with the body politic and, if victorious, with the country itself. Given the advanced age of most of this cohort, 2012 may be seen as the election in which the geezer empire struck back. This week, we’re exposing the world of campaign finance post-Citizens United, the 2010 Supreme Court case that opened the door to super PACs. The stories fall into three categories: donor profiles, pieces on super PACs, and scandals (though as Michael Kinsley said, “The scandal in Washington isn’t what’s illegal; it’s what’s legal”). This roundup focuses on national stories, but you can find more under our Campaign Finance tag on MuckReads. Did we miss any? The Republican base is angrier and more determined than it ever has been, yet Republican voters picked as their nominee the one candidate in their slate of primary challengers who depresses them. This is exactly the John Kerry scenario. Kerry was never going to win, either, and everyone pretty much knew that, too. But at least in the Kerry-Bush race there was a tremendous national debate over the Iraq war, which many people (incorrectly, probably) thought might end more quickly if a Democrat was elected. This year, it’s not like that. Obviously Republican voters do hate Obama and genuinely believe he’s created a brutally repressive socialist paradigm with his health care law, among other things. But Romney was a pioneer of health care laws, and there will be dampened enthusiasm on the Republican side for putting him in office. Meanwhile, Obama has turned out to represent continuity with the Bush administration on a range of key issues, from torture to rendition to economic deregulation. Obama is doing things with extralegal drone strikes that would have liberals marching in the streets if they’d been done by Bush. In other words, Obama versus Bush actually felt like a clash of ideological opposites. But Obama and Romney feels like a contest between two calculating centrists, fighting for the right to serve as figurehead atop a bloated state apparatus that will operate according to the same demented imperial logic irrespective of who wins the White House. George Bush’s reign highlighted the enormous power of the individual president to drive policy, which made the elections involving him compelling contests; Obama’s first term has highlighted the timeless power of the intractable bureaucracy underneath the president, which is kind of a bummer, when you think about it.